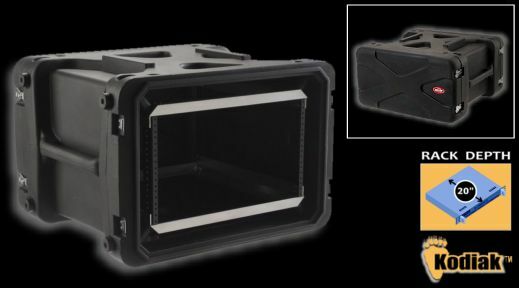 ULTRA HEAVY DUTY ROTO MOLDED KODIAK 20" RACK CASES - "Always outperforming the competition with advanced plastic technology and innovation"
*Restocking fee of 25% applies to this product. SKB's new Roto Shock Racks feature a (20" deep) roto molded tough shell with a integrally molded valance that eliminates the need for a metal valance on the outside of the case. An internal frame mounted on adjustable elastomeric shock absorbers on all eight corners. These revolutionary shocks are designed to control the effects of shock and vibration on three axes. The "sway" space around the internal frame provides natural air conditioning -- very important for delicate audio equipment. Load range of 40 to 150 lbs. Molded handles on all racks provide an easy and secure grasping point. Front and rear doors are fitted with rubber gaskets for water resistant protection. Recessed heavy-duty twist latches allow these cases to meet most ATA and military specifications. Molded-in lugs allow all sizes within the series to stack securely.Kodiak Rack Cases are offered in four different depth configurations: 20" racks, 24" racks, 28" racks,	30" racks	or the 20" rolling racks. Each size has multiple height spaces ("U") to choose from. SKB sets a new standard in Shock Rack-Mounted Case Technology with the new line of Kodiak Rack Cases. Internal frame with threaded steel frames with mounted on adjustable elastomeric shock absorbers on all eight corners. Super sized Roto-molded integral handles for easy and secure grasping point.